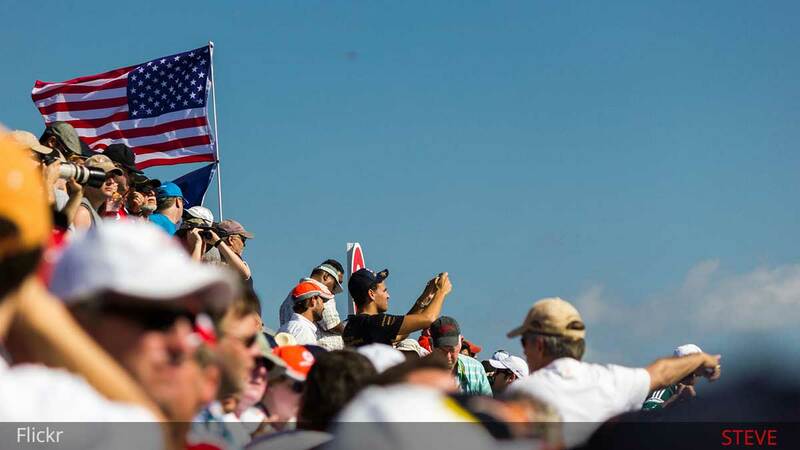 The Circuit of the Americas has proven popular with F1 fans, not just for the lively city of Austin on its doorstep but as an all round great place to watch live motorsports.In Texas, its not so much about which grandstand you’re in but which row. Wherever you are just keep in mind that while upper sections of grandstands are spectacular in the breadth of what you can see, lower rows in the same grandstand can often be quite average. In fact I’d go so far as to say a general admission ticket is preferable to many lower rows, and that’s not to say general admission is bad – it not – but compared with a good grandstand seat, its night and day. The elevated vantage point of Turn 1 grandstand offers a very unusual and dramatic view of the main straight, the pit complex and the run up to the first corner. You can’t really appreciate just how high up you are until you’re on those bleachers looking down the hill at the track. Its rarely a poor decision to watch a motorace from the first corner and with a view like this you certainly won’t be disappointed. Usually after reviewing a vantage point like this I’d say “what are you waiting for? go buy your ticket, it doesn’t get better than this!” But wait, it does. Upper rows of Turn 9 grandstand have arguably one of the best grandstand views in the sport. Elevated on a hill over the outer section of track near turn 9, cars first appear down the hill from the exit of turn 7, as you look down on the racing from on high. Though a sequence of corners the cars wind their way up to your level before turning away and dart off towards turn 11. From here the long back straight carries them towards turn 12. Watching from a distance, the straight stretching to the left and right of your vision, you really develop an idea of just how much distance an F1 car can cover in a short space of time. For the sheer expanse of the view in from of you, the variation in track, and the elevation change; this is for my money one of the best views not just at the US Grand Prix but in the F1 world. Turn 12 Grandstand enjoys views over a very large area of track, mostly quite distant, but turns 13, 14 and 15 are at a reasonable distance and turn 12, a tight left turn at the end of the long back straight is directly in front of the grandstand. It’s a spot worthy of consideration and one of the best places to watch at the CoTA for overtakes. As with any grandstand around here the upper section enjoys a more fence-free view of the track. Sat at turn 15, high up you can actually follow the racing from the back straight, breaking hard into turn 12 where overtakes are common, before negotiating the next 3 corner sequence and then darting off and out of sight around turn 16. From the top level this is an impressive view of multiple corners but from the lower rows things are pretty average with a less than bewildering view of turn 15. 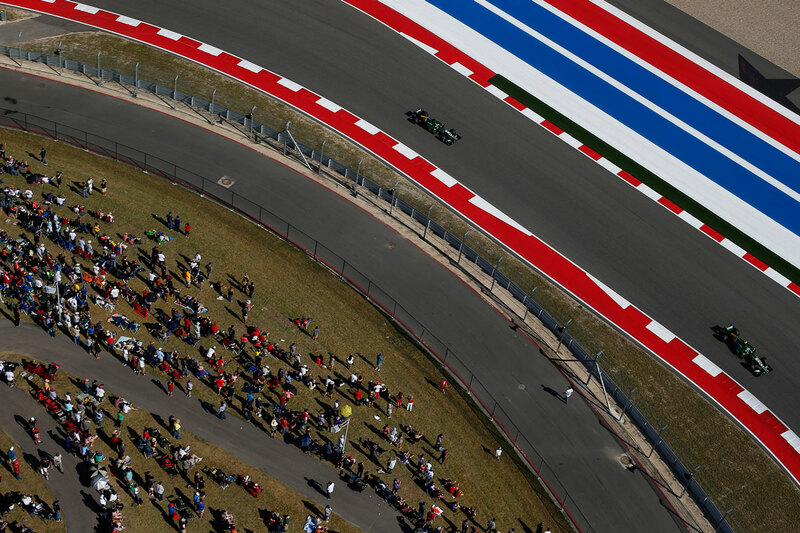 There are some very attractive views from general admission areas around the undulating elevation changes of the Austin circuit and is not a bad choice for fans on a budget. Turn 1 is arguably one of the best spots to unfold your camping chair. It’s rare that a general admission spectator can enjoy such a view, hell, its rare that anyone can enjoy such a view, looking down the hill as you are at the magnificent start/finish straight and the pit complex. It would be tough to find a better viewing area for the start of the race at least. It’s pure joy to watch an F1 car at speed through the snaking Suzuka-esque turns 3 to 5 section, and just because you’re in general admission doesn’t mean you have to miss out on this. Views are mostly through the fence but its worth spending some time in this area. There’s a very limited but I can only say, spectacular, view from a pedestrian bridge that crosses over the track between turns 2 and 3. By limited I mean that as the bridge is mostly covered you’ll only be able to stand on the steps to enjoy an unobstructed-by-catch-fencing view of the action. Worth seeking out for a photo opportunity if not a practical long term option. There’s also a nice raised bank adjacent to the penultimate corner which affords an elevated view over the end of the lap and the pitlane entry. It’s also well worth taking a wander down here at some point. 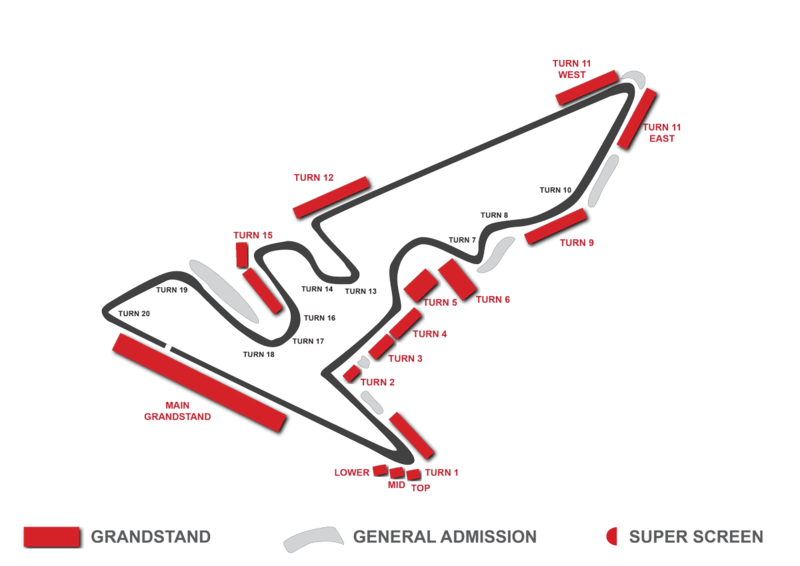 As we’ve seen, most of the best spots for general admission are covered in the first sector of the circuit from about turns 1 – 5 so a good strategy for the race is to start at turn one where you can watch the start and return later in the race for the pitstops and the end of the race.